Warren Ellis tackles the same theme from Marlowe's Faustus, and carries the grander ambitions of comics with him. You only ever get a few turns at the wheel. It's really nothing like Captain Kirk, or Shakespeare or Elvis. You don't make a mark and have that entitle you to making a mark over and again. Or to cast the debate in more recognizably comics terms, not everyone can be Alan Moore. Especially not now, when the bar to entry for making comics is so low. When the actual machineries for producing comics and finding an audience has become wholly democratized with publishers like Image and crowdfunding websites like Kickstarter. But not too long ago, more or less coterminous with a historical moment when the world of popular music could be divided between Michael Jackson and Madonna, and when the phrase "King of Pop" was not used ironically, not in the least, it would be perfectly acceptable to consider comics driven by a kind of star creator system. You bought comics because you trusted the creators behind the project. This was really the instinct that fueled the first wave of creator owned projects. You bought Sin City because even if no one's ever heard of it, you've heard of Frank Miller. And you trusted him. In an interview with Dark Horse President and Publisher, Mike Richardson, Richardson asserted that many more of the properties created and developed by Dark Horse since 1985 have outlasted newer properties created by Marvel in the same period. The notion speaks to the relative success of the expansion of the business model of comics with new publishers like Dark Horse and Image/Top Cow. The greatest fear of the '80s, that somehow we'd get trapped reading nothing but Golden Age superheroes from the '30s and '40s and Silver Age heroes from the '60s and '70s, was just demolished. But what about fears that were given birth to during the '90s? That somehow only a handful of creators would get to entertain us through the medium of comics. Back in 1987, coming of their respective runs of Watchmen and The Dark Knight Returns, that group of superstar comics writers was really very small. Really only Alan Moore and Frank Miller. But with expansions in the industry, that soon shifted to include other visionaries associated with groundbreaking, medium-defining word. Neil Gaiman on Sandman, Todd McFarlane on Spawn, Grant Morrison (who's really had a far more picaresque career than the former writers, but if you dig deep enough into his bibliography, early on he was defined by his work) on Animal Man. Hang around a little longer until Millennium and that list expands to include writers like Brian Michael Bendis, Robert Kirkman and the prolific Warren Ellis. This is where we come in, with Warren Ellis. Because this is a story about how our ambitions for a grander comics, a comics that can stand on equal footing with art and literature. And to do that, we'd have to strip away the Hollywood from our expectations, let go of "star-system" from both our nomenclature and as a concept. And reintroduce the notion of "masters," as in "masters of the comics art," in exactly the same sense that we refer to Leonardo or Michelangelo as "masters". This is a story about that, about the rescue of the star-system, and why that's still important. And a story about why Ellis at his best and with his many collaborators over the years might hold those ambitions of a grander comics in his palm. From Injection #3 by Ellis, Shalvey, Bellaire published by Image. It wasn't always good. But when it was good, when Ellis's writing was heavyweight, it was something sublime, writing that led you into worlds that could, I will not lie to you, be imagined. These were stories like Planetary, Global Frequency, Desolation Jones, Orbiter. Hard scifi, in other words, scifi that makes use of actual science as the engine for its fiction, and when Ellis did turn to magic, it was magick, with a kay at the end, the Old Ways, and even that was subjected to a pseudoscientific hard science approach. The unique Ellis brand of storytelling—ghosts that are really quantum echoes of persons trapped between two branes of the multiverse, xenosociological civilizations that conqueror the galaxy through language signals that wrest control of human consciousness, transuranic heavy elements that allow for the negating of relativistic effects during chemical-combustion space travel—arguably gave Ellis the scope to do the real work of artistic masters—wrestle with ongoing themes across various works. That's really the heart of the matter. That you can recognize an Ellis project, even in the absence of attribution. Ellis is a rare writer, and rarer still in comics, that leaves an imprint on a work that has almost nothing to do with the story itself. The kind of writer you can build scholarship around. Not that you should, because Ellis's writing remains popular, and easily accessible. But if you'd wanted, scholarship is an option available to you. Take Aetheric Mechanics for example. 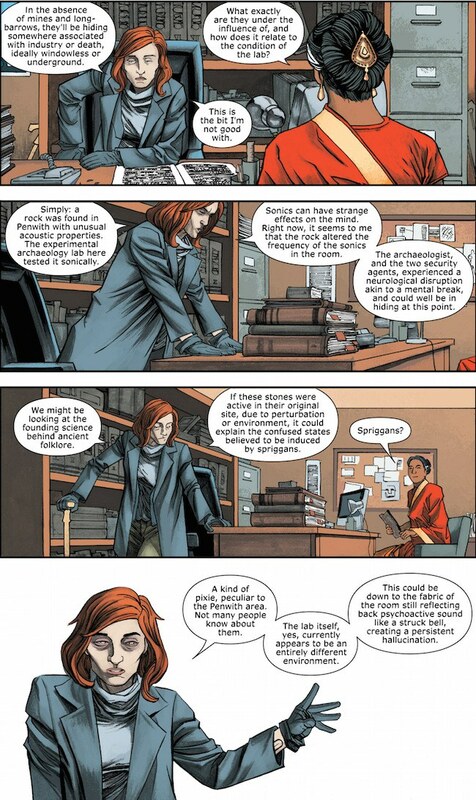 On the surface of it, the graphic novella looks like an "alternate reality" Sherlock Holmes. Hovercraft abound and Britain remains an Empire well into the days when our planet fought World War II. Everything looks like updated Victorian Era kitsch. The story sees the Sherlock analog investigating the case of "The Man Who wasn't There." There's a kind of limitation to society that's almost palpable. Social limitation, even scientific limitation even in the face of some technological advancement. They don't have antibiotics yet, but they do have flying cars. Also, they don't have atomic science. So quantum mechanics is beyond them. That that's really the solution to that case. The man who wasn't there, wasn't there because of a quantum accident when he and his team charged up something not too different from the Large Hadron Collider. The unexpected effects of which saw him wink in and out of existence. Ironically, it's the world of the Sherlock analog that's not real, but one cobbled together from the observational intent of the experimenter who'd been reading Sherlock Holmes stories when the accident occurred. The Man Who Wasn't There, it turns out, is really the Sherlock analog. Until the Sherlock analog murders the quantum experimenter who'd been "committing crimes," all along trying to reassert the "real world" he'd lost. It's a beautiful tale that ends on a note of fury and revenge and unconditional defense of one's right to exist. It's sublime and Dickensian in scope. But more importantly it's also an extension of, an exploration through other means and another fiction, of some of the themes found in Ministry of Space, in that Apparat book Frank Ironwine, later in Planetary and much earlier in Atmospherics. What makes Injection so magnificent is that has the makings, just now with the release of "Issue Three" this past Wednesday, an Ellis magnum opus. One book that marries together all the themes, and all the interests, and all the techniques and lays the groundwork for an entirely new direction. 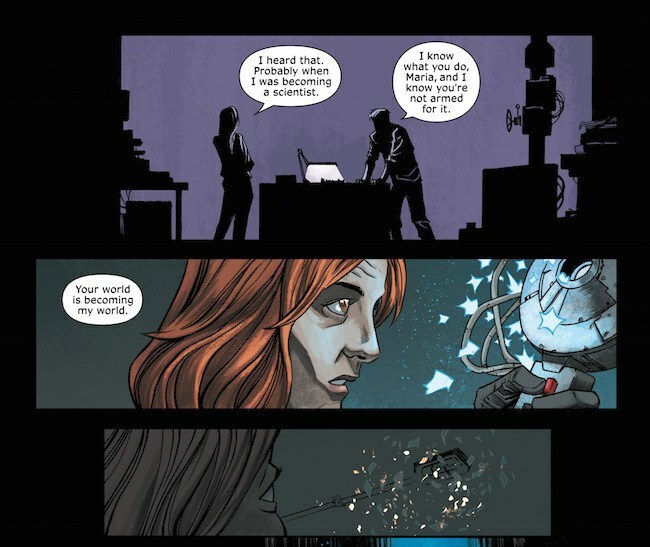 Injection comes on the heels of Ellis's criminally short run on Marvel's Moon Knight, the 2014 reboot. (Only six issues). 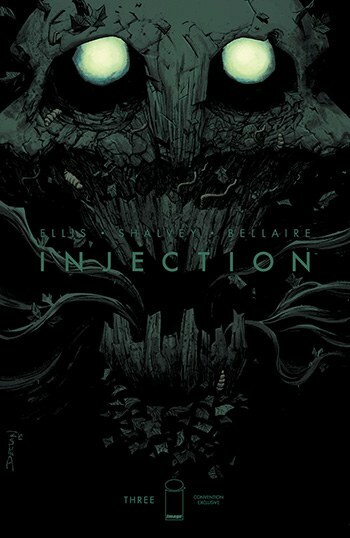 It's where the entire creative team for Injection, Ellis, along with artist Declan Shalvey and colorist Jordie Bellaire met. Injection seems poised to keep a number of promises. The promise of last year's Moon Knight for example, that stories can be told concisely and episodically, and through the smallest of windows unfold an entire world of narrative complexity and depth. But also the promise made by Bryce Zabel, one that was never delivered on, at a time when Chris Carter's X-Files was riding high—the promise that not everything strange in the world was some spontaneous eruption, that some of the strange and dangerous were things made by human hands. We don't have the whole picture yet, as far as Injection goes. But we know at some point, sociopolitical forces in Britain conspired to push together an archaeology professor, a hacker with superior skills, a criminal investigator, a secret agent for MI6 and a pagan wizard on loan to the British government. At some point, this group "constructed? ", "summoned? ", "enacted?" the Injection and they broke life on this planet. "You're going to make me say it," Robin Morel says in this last issue of Injection, "You're abetting the industrial exploitation…of artifacts and effects from deep time, and before you argue let's remember that FPI stands for Force Projection International and the Injection knows it and, is, yes, leaving little IEDs of warped physics laying around for you people to step on as you stumble around in fields you don't know enough about, Maria." And later, an even more magnificent line, again from the wizard Robin Morel. "I heard that," Professor Maria Kilbride says in response to Robin speaking about the four fundamental forces and in particular electromagnetism, "Probably when I was becoming a scientist." There's a beat. "I know what you do Maria, and I know you're not armed for it," is Robin's sober reply, "Your world is becoming mine." Two months ago we read the first issue of Injection and it seemed fun, fun enough to pick up the next issue. It introduced the team in a kind of "eight years later" scenario, that think tank they were all part of? It got blasted to hell and simply is no more. Everyone's gone their separate ways and the world is once again under threat from something they were investigating back then. Last month, the second issue was fun in a Kill Bill kind of way. It saw Simeon the secret agent man murder terrorists in possession of something related to the Injection. But this issue, this issue was a genuine return to the kind of writing that should prod you to consider Ellis as a classical master of comics, a Vermeer or a Rembrandt. It's that flashback scene. The one where we're back with the think tank meeting for the first time. It's what they say to each other, what they confess, about why they're exceptional. Robin Morel who wants to evade his family legacy as a "cunning-man," Brigid who built a machine that could pass the Turing Test by giving it Darwinian drives, Simeon who's a top level strategist for MI6, who "starts fighting before the other side knows there's a war on." This is the best kind of story, it's Faustus. The story of people at the top of their game, who've out-evolved the social paradigms that created them, and who broke the world in looking for the next horizon. And this is where we exit, with the wheel still in spin. Despite the democratization of access to making comics, there was a time not too long ago, when we were all just fans, not potential creators waiting in the wings. It was a time when comics, as a medium, was just about ready to launch. When artists and writers were ready to be the equals of the great masters of the past. Shakespeare, Mozart, Michelangelo, Truffaut. We wanted greater things for ourselves back then. We shouldn't turn our backs on that now.